We left Yuma at 0430 and started up Black Mountain in the San Jacintos shortly after 0830. The weather was perfect and the birds were singing, especially the Dark-eyed Juncos, Mountain Chickadees, and Western Tanagers. We stopped a couple of places and did some short walks on the way up the mountain, enjoying the creek, the fresh pine smells, and the birdlife. 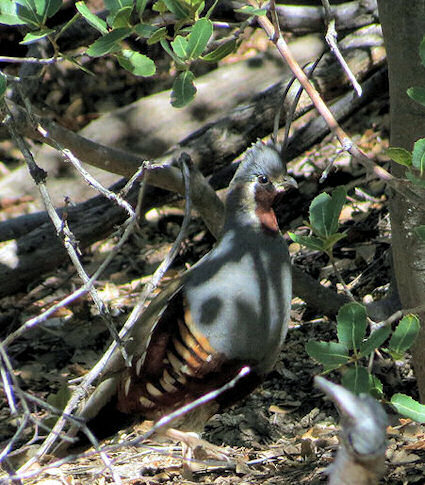 And then, just as we’d started back up the dirt road, a female Mountain Quail and four chicks were walking across the road and up the hillside! It was a life bird for Suzanne and my first look at young ones. At the top of the mountain we did really well with woodpeckers, finding a nesting Red-breasted Sapsucker, a family of White-headed Woodpeckers, and a pair of Nuttall’s Woodpeckers. On the way back down we were “serenaded” by an Olive-sided Flycatcher. Good birding! July 13th, 2012 at 7:33 pm Great shot! !